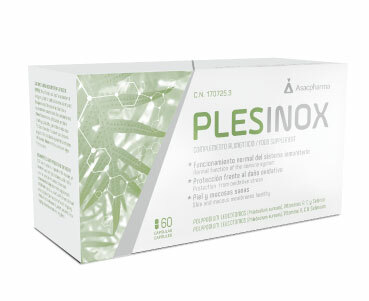 Plesinox, is a triple-action food supplement that combines standardized extract of Polipodium Leucotomos, Vitamins A, C and Selenium. Vitamins A, C and selenium contribute to the normal FUNCTIONING of the skin's immune system. Vitamin C and Selenium contribute to the PROTECTION of cells against oxidative damage. Vitamin A contributes to the MAINTENANCE of mucous membranes and healthy skin. Contributes to the normal functioning of the skin's immune system. Protects cells from oxidative damage. Maintains healthy mucous membranes and skin. Protects from damage caused by UV radiation, photo-protector. Orally. Take 2 capsules: 1 in the morning at breakfast and 1 in the evening at dinner, with a little water or juice.